Ken has been﻿﻿ passionate about learning and teaching wine for the past 15 years. He feels it's a window into a world of intellectual and hedonistic experience involving nature, science and culture that is unmatched in any other discipline. BottleCru is the result of his experience as a wine educator, a Sommelier at corporate functions and as the Executive Sommelier for a chain of grocery stores in the Bay Area. Prior to his focus on wine, Ken built several successful high tech start-ups and has degrees in Engineering and Computer Sciences.
" I approach wine education with an attitude of humility and shared enjoyment, not snobbery or arrogance. Wine should be fun and enjoyment!" Tim Gaiser is a nationally renowned wine expert and Master Sommelier. From 2003 to 2011 he served as the Education Chair and the Education Director for the Court of Master Sommeliers Americas. He also serves as an adjunct professor for the Rudd Center for Professional Wine Studies at the Culinary Institute of America at Greystone in Napa Valley. Tim has experience in all phases of the wine industry - online, wholesale, retail, winery, and restaurant - including stints at Heitz Wine Cellars in the Napa Valley and Bix and Cypress Club restaurants in San Francisco. He has developed wine education programs for restaurants, winery schools and wine distributors; and taught classes on wine and spirits at every level of education. His client list includes Constellation, Fosters, Diageo, American Express, Evian, Pepsico International, Franklin-Templeton, Wells Fargo, Wines of Germany, the VDP and the Consorzios for Prosecco Superiore, Chianti, Chianti Classico, Vino Nobile di Montepulciano and Brunello di Montalcino. Prior to developing his wine expertise, Tim received an M.A. in Classical Music from the University of Michigan. He played classical trumpet as a freelance professional and as an extra with the San Francisco Opera. ﻿﻿﻿﻿﻿﻿﻿﻿ ﻿﻿﻿﻿ ﻿Li﻿﻿llia﻿﻿n is an experienced and Certified Sommelier. She is also a Certified California Wine Appellation Specialist having spent a lot of effort to get to know California wines in detail. She’s been delighting wine consumers by selecting and serving them for over six years. She not only has extensive knowledge in wine but in cheese as well. Her cheese talents are those of specialists called “Cheese Mongers”. She’s also had many years of retail wine and cheese buying experience for retail shops and wine bars. Her wine analytical and tasting talents are supported by a strong engineering background. She has several degrees in Engineering and Computer Sciences but found her true love in wine. She loves a wide range of wines but will admit to having a special place in her heart for Burgundy and Champagne. ﻿﻿﻿﻿﻿﻿﻿﻿ Mary Jane is a wine educator and sommelier with many years of experience working in the wine,food and hospitality industry. 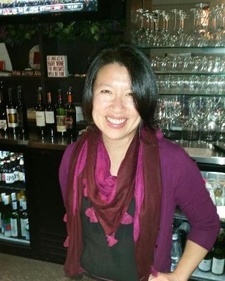 She is a Certified Sommelier, Certified Italian Wine Professional, and Certified California Wine Appellation Specialist. In addition to her wine knowledge, she has experience in the culinary industry as a chef’s assistant for Draeger’s Culinary Center, Sur La Table and for a home parties company. She has attended culinary courses here and abroad. Mary Jane also has a degree in communications with experience in radio news and public relations. Last and not least she is a freelance food and wine writer with articles appearing in The San Jose Mercury News and San Jose Metro. Maria Terry is an experienced wine professional. She is both a Certified Sommelier and has a degree in Oenology. She is a broadly educated person with both a Bachelor degree in Chemistry and MBA in Marketing. Maria has been a wine buyer for wine shops, taught classes in wine appreciation, judged multiple wine competitions, and arranged wine tours for private and corporate organizations. These days, her passion for wine expresses itself primarily in food and wine pairing. She writes a monthly column for local papers offering recipes and beverage pairing advice and also leads BottleCru’s Wine Pairing Guide's development. Bud is an experienced high tech executive that scales software and services tech companies. He has held executive management positions with enterprise software and services companies ranging in size from pre-revenue to $100M+ in annual sales. A customer-facing executive with 35 years experience in sales, marketing, and business development, Bud has consistently found and built new, high-growth markets resulting in accelerated business performance. John has nearly fifteen years experience in product management in the San Francisco Bay Area, working at some of the most iconic consumer internet companies including Yahoo!, eBay and Netscape. Before coming to the Bay Area, John graduated with an MBA from Kellogg School of Management at Northwestern University. John has a deep passion for wine, primarily Bordeaux and Brunello, and started a wine storage company which he owned and managed from 2007 to 2013. He brings a combination of product and online user experience savvy with a critical eye towards what makes a compelling and intuitive wine website experience.